The third Ride Culture Oil event in the series is set to blow your mind and keep you wanting more - follow us on instagram @RideCulture_Oil and find us on Facebook to stay up to date with our developments. Friday 20 - 21st of October played host to a real spectacle of Motorcycle Culture and History. Again the fabulous Paintworks Event Space in Bristol was filled with Motorcycles from all spectrums of life. You didn't need to be categorised / segregated, we were all there - Harley Davidson, Triumph, Cafe Racers, Ice Bikes, Easy Riders, Low Riders, Vespas, 125s, Electric Bikes. Workshops such as Bristol Bobbers, Scars Motorcycles, Avon County Choppers, Kevils Speed Shop, Redmax, all brought some serious noise to the event. 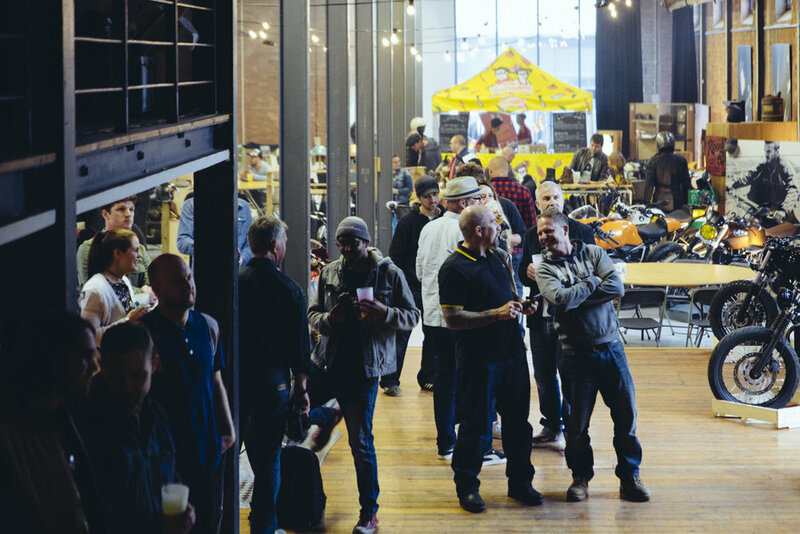 Brands / more well known names like Deus ex Machina, Yamaha, Mutt Motorcycles, Old Empire, English Electric event brought Demo bike to the table in October. Film and Q&A sessions included the likes of Ashley Watson who has designed and fabricated possible the most well thought out, wearable motorcycle jacket on the market. Bands like John Dean, Parowan, Indigos, Steve Page and our mate Slidey Sam absolutely stole the show. Storm Brian didn't get the better of us !! On Saturday 13th May we held our first Ride Culture Motorcycle event! 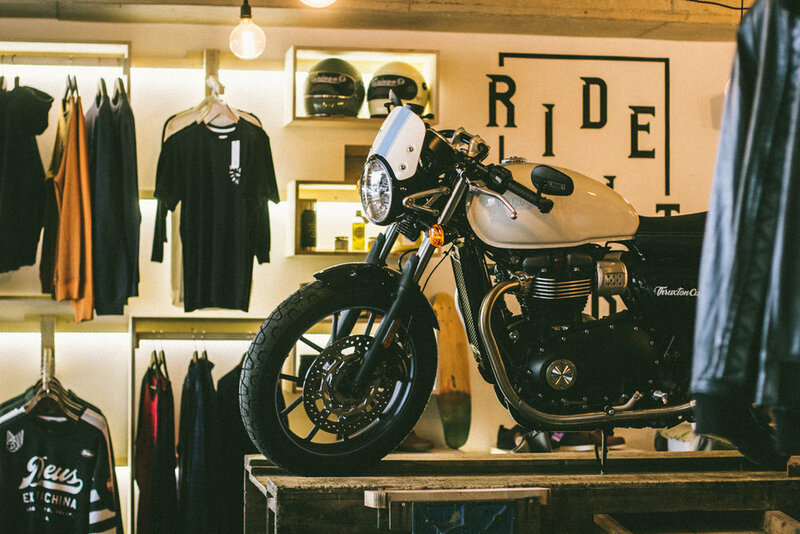 Showcasing a celebration of the resurgent bobber, café racer and retro motorcycle scene. Partnering with Fowler’s; Bristol’s well-known and long-established motorcycle dealer, we showcased a number of brands including Yamaha, Ducati, BMW, Belstaff, Bell and Hedon. In addition, the team at Fowlers picked a selection of cool machines to bring to the show, including its own ‘take’ on the all-conquering Triumph Bobber, plus a pair of Yamaha’s yard-built custom machines and a Moto Guzzi V7 Sport in retro colours. As BSFF was such a success, we held the event at our favourite venue - The Paintworks who again failed to disappoint! Hosting a weekend of ride-outs, food, drink and music, the event was a great success. Musicians a plenty, we had to invite our resident Blues slide-guitarist Steve Morrison, along with Street busker Slidey Sam playing lap guitar, Flowerpot, a 3-piece Girl Rock Band, Jazz/Blues outfit The Weeds & Swing drummer Dylan Radclyffe. Street food was provided by our very own Spoke & Stringer kitchen, perfectly complimented with craft ales, local cider and Easy Jose´ speciality Coffee. The unveiling of the new 2017 Triumph Bonneville Bobber. Hosted by Fowlers the bike was described as 'brutally beautiful'. A passion driven event in search of adventure and a love for ride culture. To fuel the event Spoke & Stringer's chefs made some incredible street food, falafel, pomegranate, hummus wraps bringing the flavour of morocco to the evening. All accompanied by St Austell's "Cornish larger with soul" Korev. The atmosphere was buzzing and everyone was excited for the unveiling of the Bobber. We had Sam playing the Slide guitar, as everyone cruised around the shop looking at the new Biltwell helmets and admiring the bikes that had gathered for the evening. The unveiling took place at around half 9 and the Bobber was revealed in all its beauty. All the electronic components on the Bobber are hidden giving it clean lines. The rider focused technology and signature Bonnie straight-line ‘hidden cat box’ exhaust run, are all neatly incorporated without interfering with the Bobber’s stunning looks.